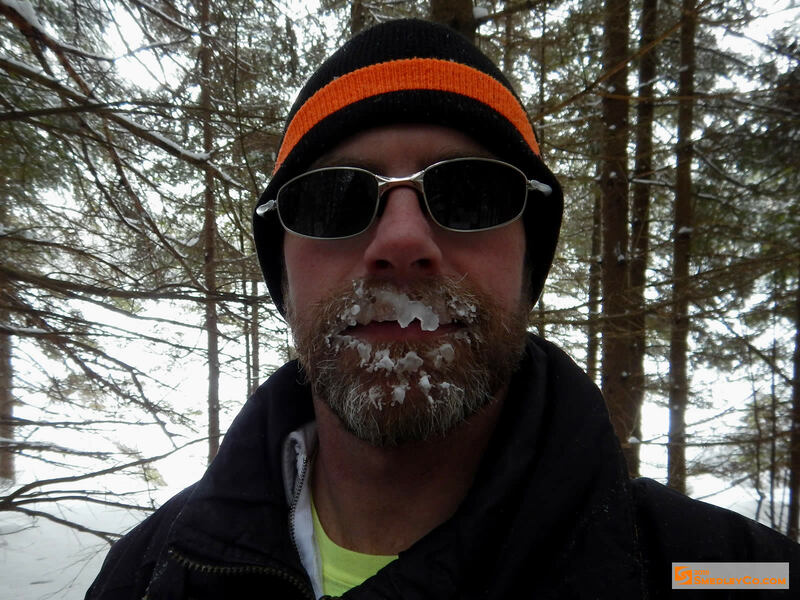 Trip Log: February 12 - 16, 2015 Pinetree Lake. The annual winter camping trip was scheduled for the Family Day weekend as usual. But this year it was a double whammy as Valentine’s Day fell on the same weekend. I guess us guys don’t have much of a love life as we had more people attend than ever before! Martin had just purchased a new stove and tent and was eager to put them to use. With other people coming in for a day trip visit we were expecting up to 9 or 10 people on the Saturday. 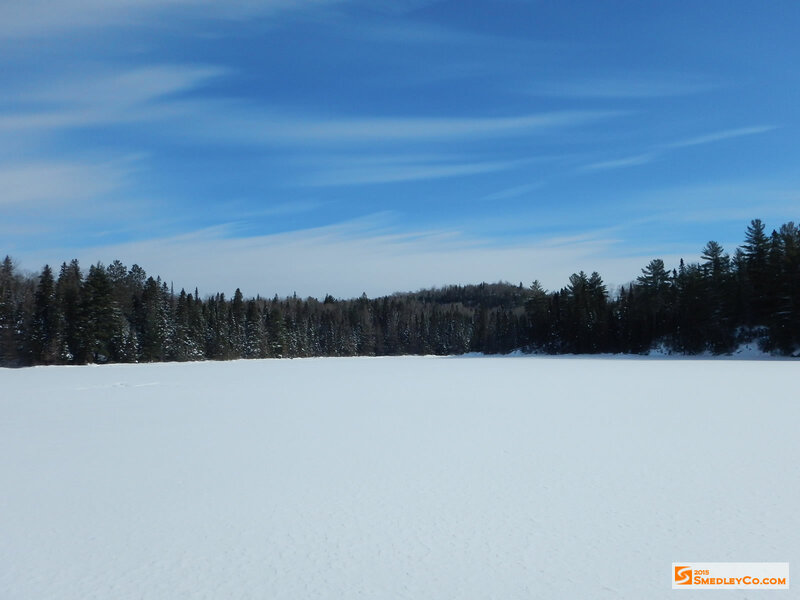 The location set for this year’s excursion was Little McCauley Lake, a randomly picked lake off of Highway 60 at Brewer Lake. It seemed like a good idea at the time. 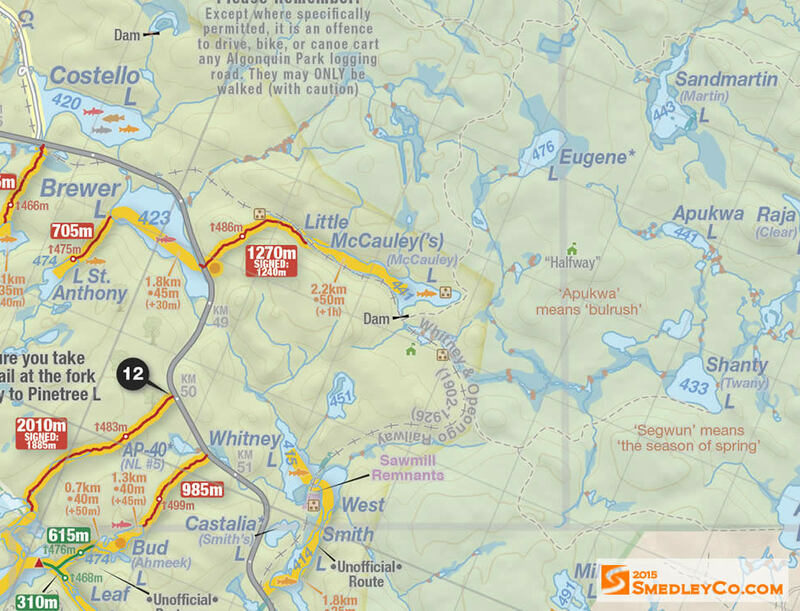 Map - Little McCauley Algonquin Park. Original plan of attack for Little McCauley Lake. 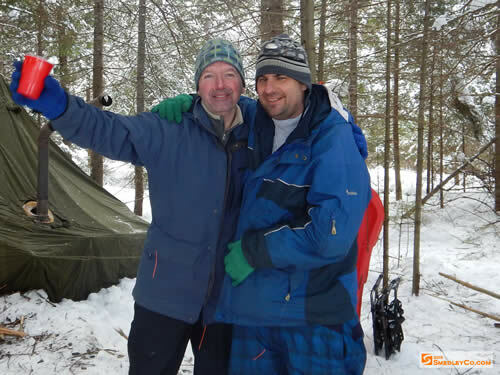 I was on the road at 5:30 AM with the plan to be at the West Gate of Algonquin Park when it opened to meet up with Markus and Glen. It took a bit of extra time to get my new eight foot long pulk loaded up, it stuck three feet out the back of my truck. It was the usual quick run and I was soon at the gate where I was the last to arrive as always. We were assured, for the third time, by Park staff that parking at the Brewer Lake pull off would be no problem at all. 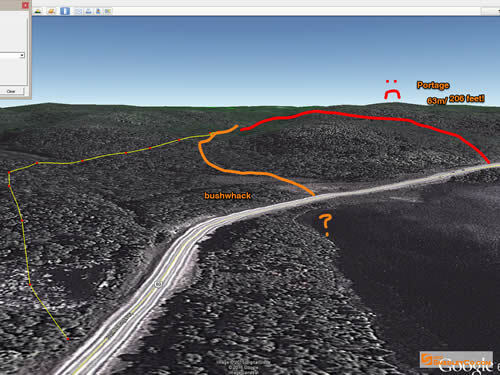 As we drove up to it I could see that it wasn’t recently plowed, but Markus drove straight in any way! Promptly getting stuck. The wind was howling and it was twenty below as we mucked about trying to park and decide what to do. 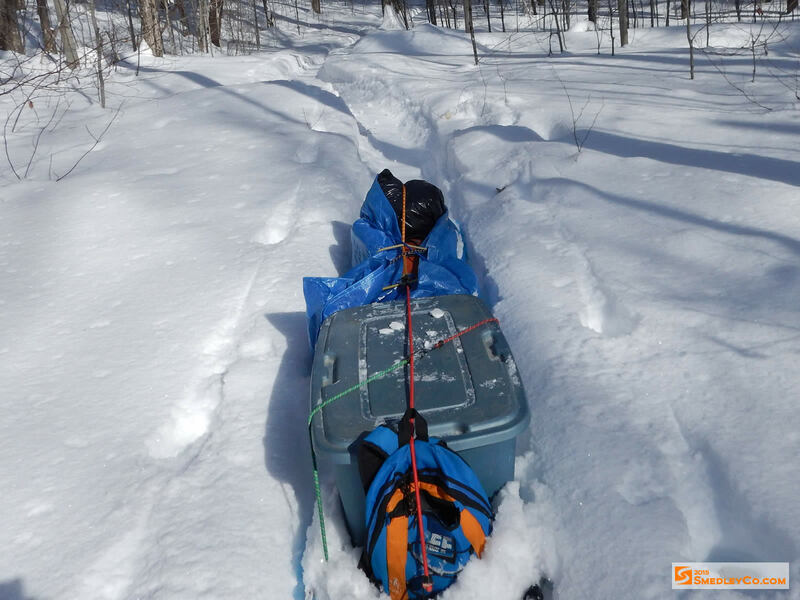 Knowing the route into Little McCauley was going to be tough, we were already frozen and the parking situation wasn’t good we made an on the spot decision to change our destination. While doing all this another Park staff came along and told us our parking location, especially Markus half way into the pull off, couldn’t remain the way it was. Thanks, where were you the first three times. After about half an hour dragging Markus out of the snow bank we continued down the highway to the Pinetree Lake Access Point. 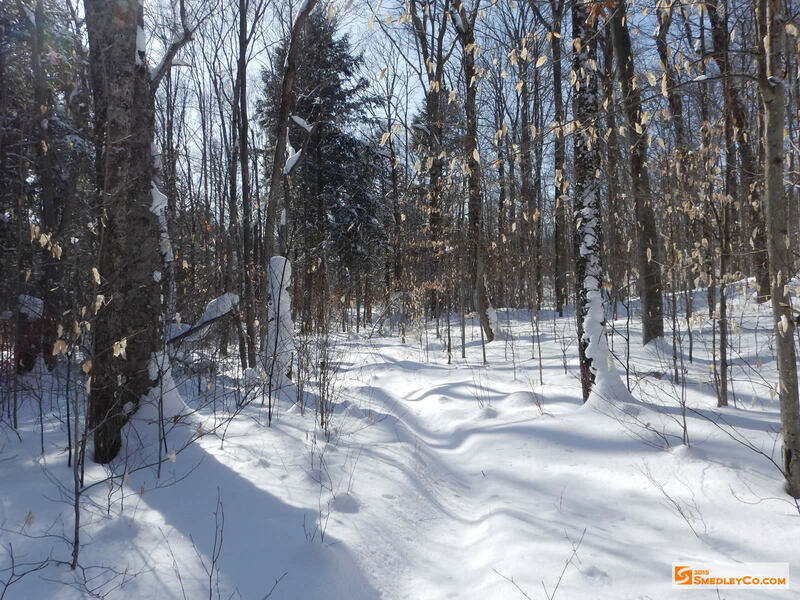 We’d been to this location two winters ago and knew what to expect, plus the parking area was plowed out. Arranging the vehicles so as to leave room for the rest of the crew coming in this weekend, we unpacked and loaded up the pulks. Glen getting ready to head out. 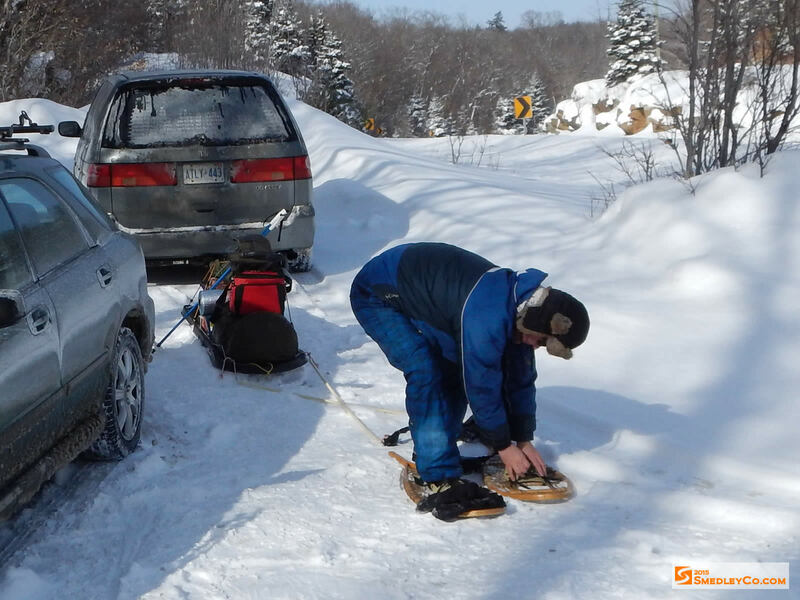 Markus strapping on the old school snowshoes. 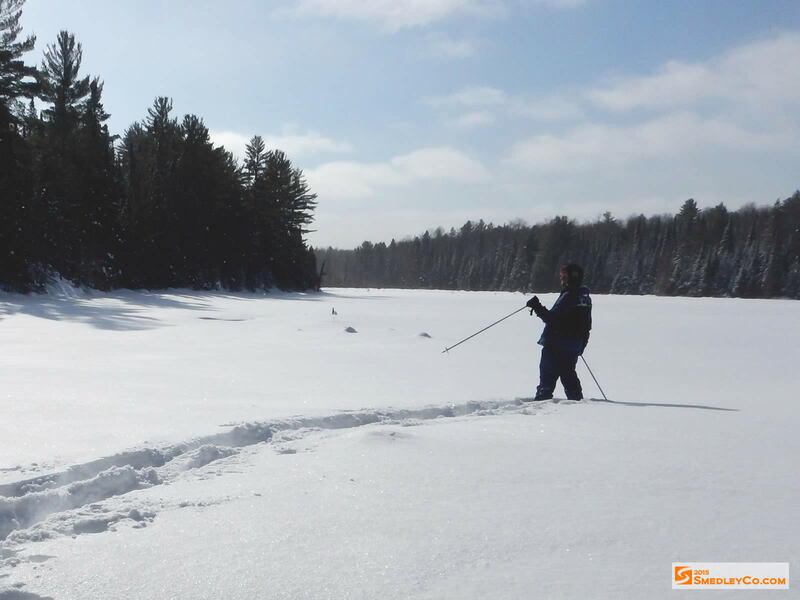 Starting down the snowy Pinetree Lake portage. 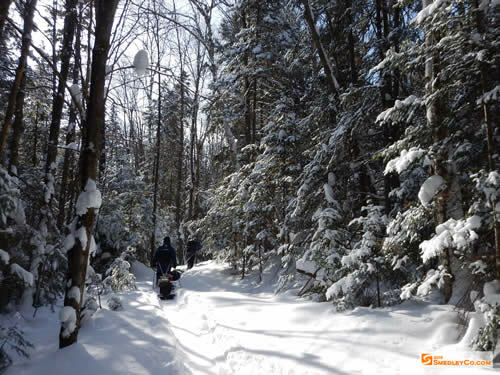 The snow was deep along the portage trail, but luckily someone had been in fairly recently and we had a little bit of a trail to follow. 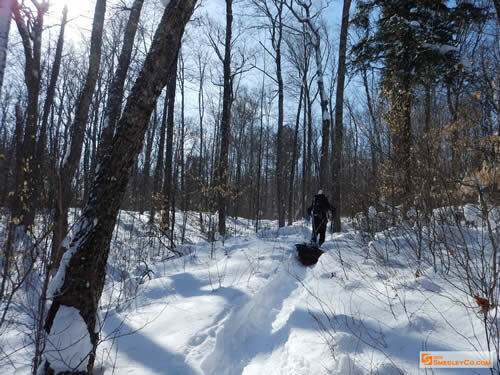 But it was still some pretty tough slogging, the lead man was doing a lot of work and we rotated positions frequently. 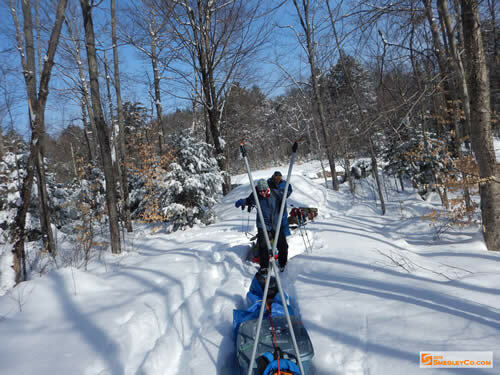 The portage has some hills, there’s a good climb at the beginning, and some nice scenery along the way. 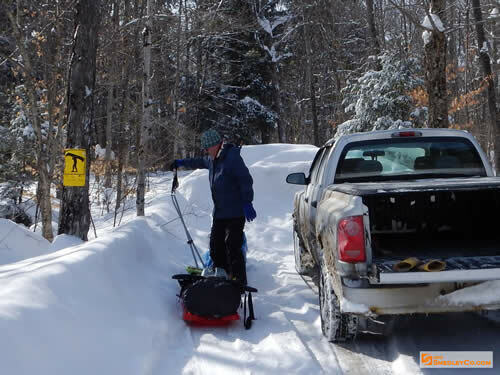 Glen breaking trail with his tiny pulk. Markus at the back of the line. My new longer diy pulk. It was about noon and cold. While the sun was out we were in the shade of the forest mostly, but at least that cut down on the wind. Still rocking the manly beard, it became coated in ice from my breath before finishing even half of the trip in. Trail through the dappled forest. It took about an hour and a half to reach the dog leg just before Pinetree Lake. Along the trail we had decided to have a look at the little pond just before Pinetree for protected camping spots out of the prevailing winds. It was expected to be a very cold weekend and we knew from our previous trip that suitable winter camp sites on Pinetree Lake can be difficult to find. Glen looking over pond near Pinetree Lake. Markus starting across the pond. We crisscrossed along the shore, venturing in a bit now and then if we thought there might be a clearing suitable for setting up the tents. Eventually we settled on a point west from where we entered the pond. Tucked up from the pond and with lots of tree protection we found two spots suitable for our tents and went about the business of setting up. The three of us were quite cold, especially toes, if standing around. 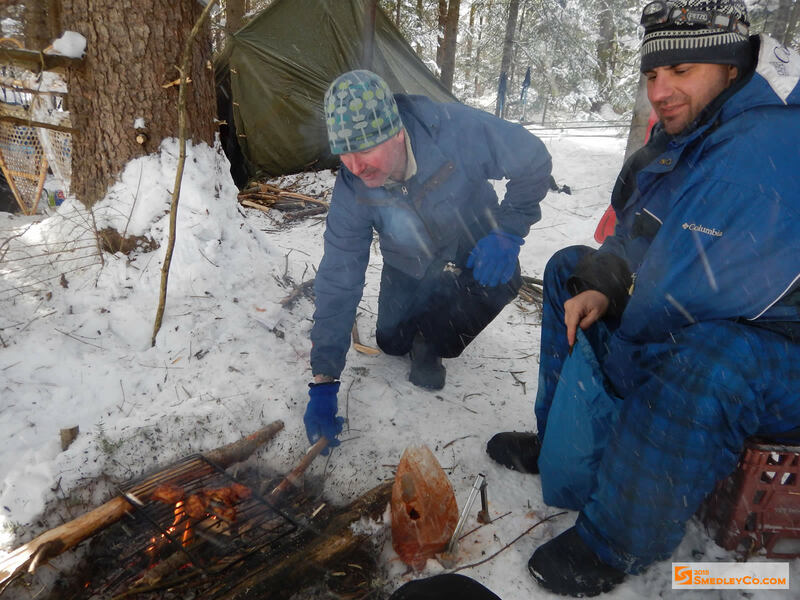 So we made a rush of getting the tent up, the stove in it and a bit of wood to have a fire to warm ourselves. You think its funny, but its not. 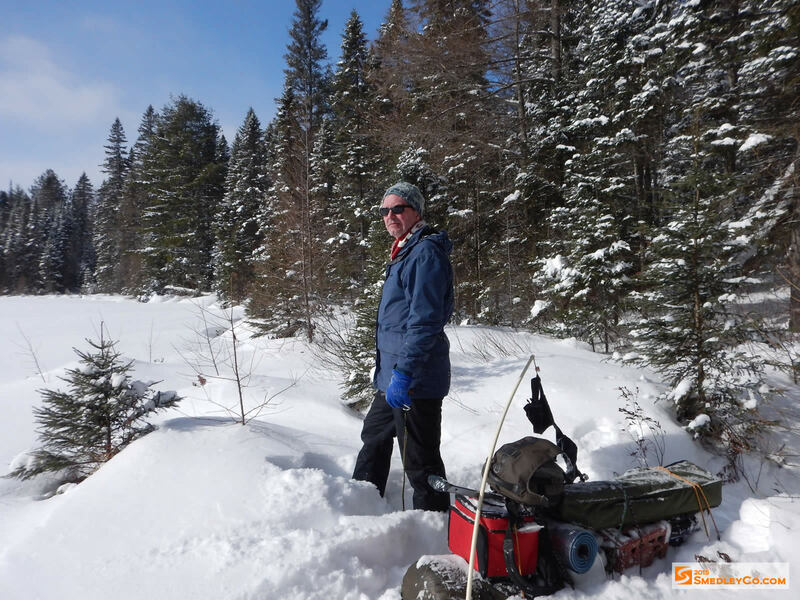 Winter camp setup along Pinetree Lake. 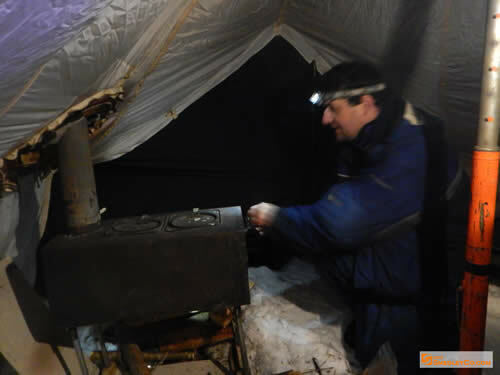 Markus gets the hot stove going in the tent. 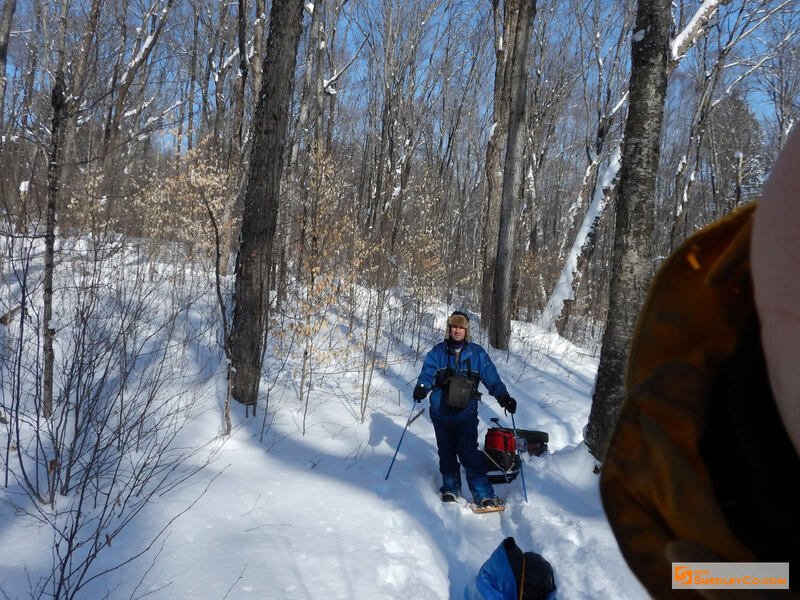 By five-o-clock we were in good shape, the cots and sleeping bags were arranged, the stove going and the bar open. We had supper, relaxed and talked about how cold it was. But we were comfortable in our tent despite the dropping temperature outside, we just had to remember to throw some wood in the stove every now and then. As usual on the first night, it was an early bed time. We woke up to a very cold tent, well not those of us smart enough to pretend to be still sleeping until Glen got the fire started. Then it was perking coffee and thawing out breakfast ingredients. Markus gave an attempt at making French toast but was only moderately successful. He gave up part way through and switched to scrambled eggs. 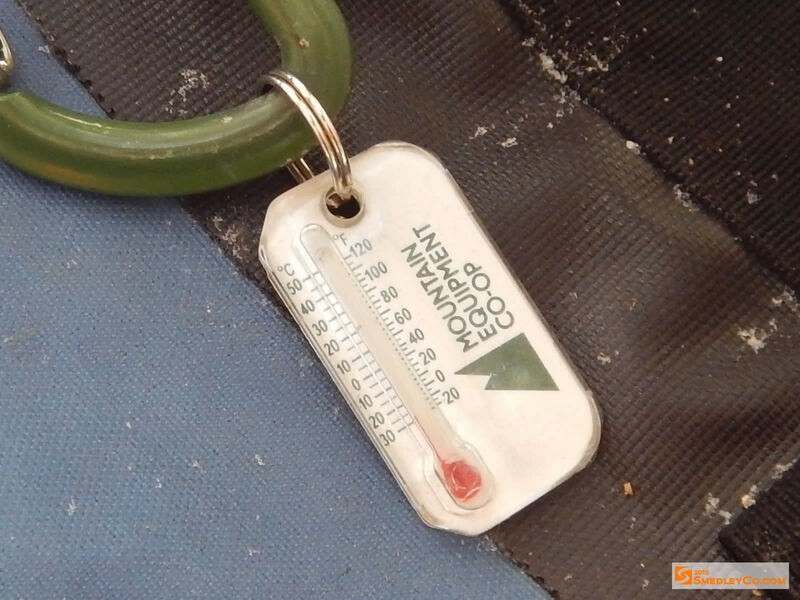 A chilly -28° Celsius in the morning. My beat-up, trusty coffee percolator. Eggs and a bootliner warming on the wood stove. 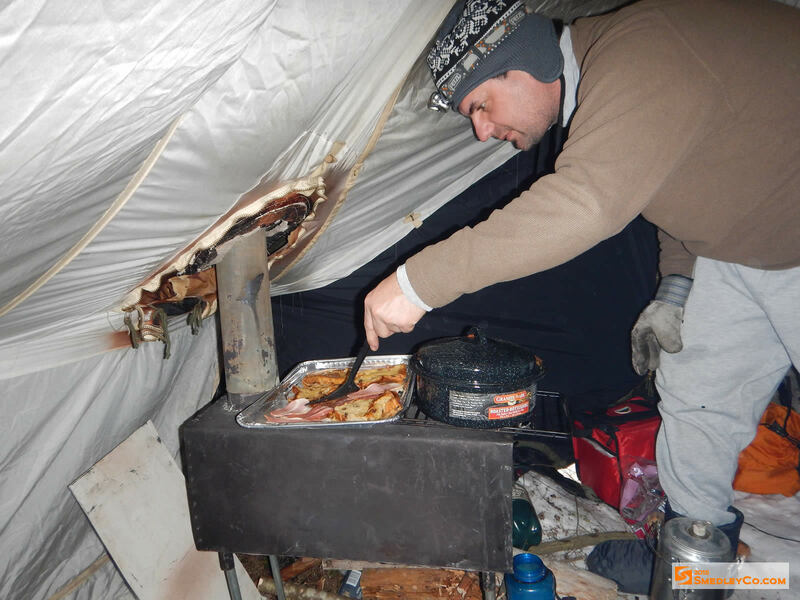 Markus attempting french toast on the roaring wood stove. Outside the dim tent it was a crisp bright day. 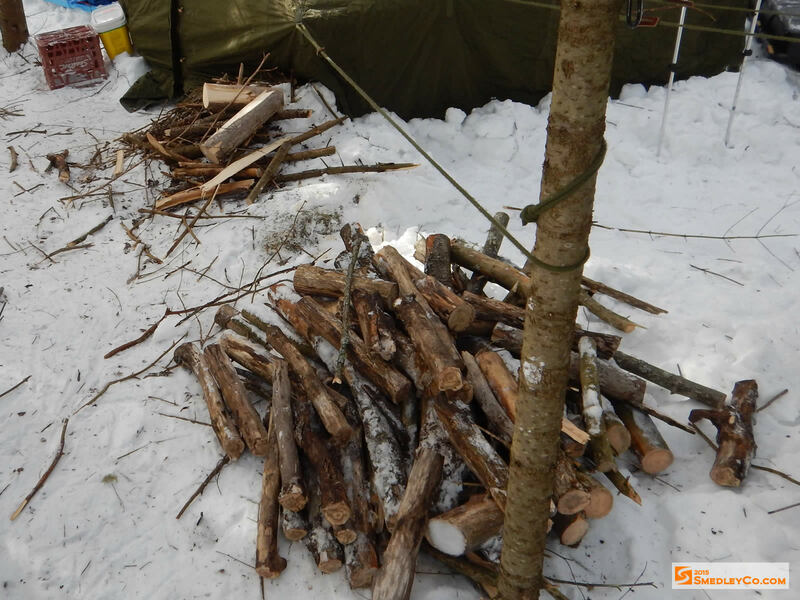 The cold temperatures overnight sure put a dent in the small wood pile we had built the afternoon before. So the first order of the day was more firewood. With three more nights ahead of us, and a whole crew coming in to visit, we knew we needed a large amount of wood to keep everybody warm. We pretty much spent the next few hours at this task. We snowshoed down the lake and up into the woods looking for dead standing trees. 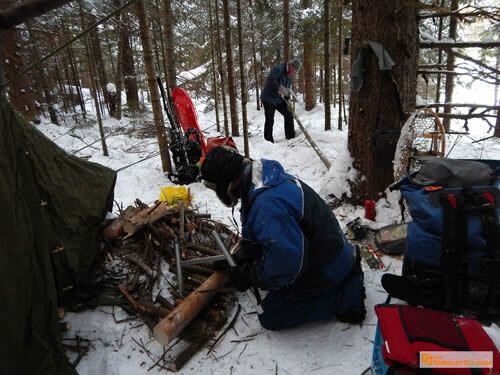 Then we dragged large pieces back to the open lake surface where we cut them to stove length. Loading up the sleds with cut firewood was a lot easier than dragging big pieces to camp and trying to cut them up in amongst the trees around the tent. Clear skies made the lake surface very bright. 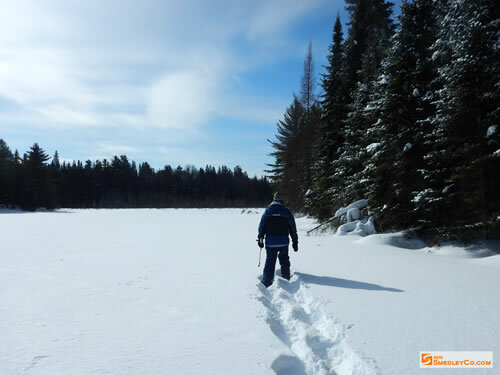 Markus heads down the lake to look for firewood. The start of gathering enough wood to keep warm. Once the work was done we started an outside fire where we had some room to gather and Markus cooked up some Buffalo Chicken Wings to go along with our Dark and Stormys. 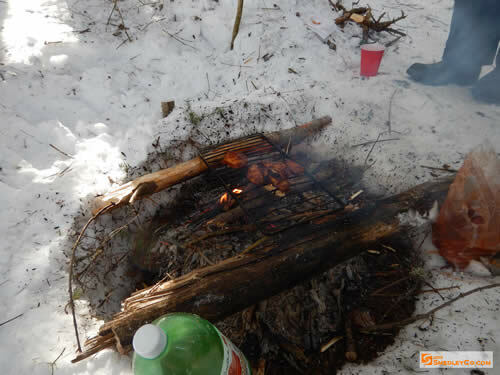 It was sunny but very cold, the trees protected us from a light wind but it sure was nice to have a fire to huddle around. Buffalo chicken wings and rum. Life is good. Friends around the fire pit. 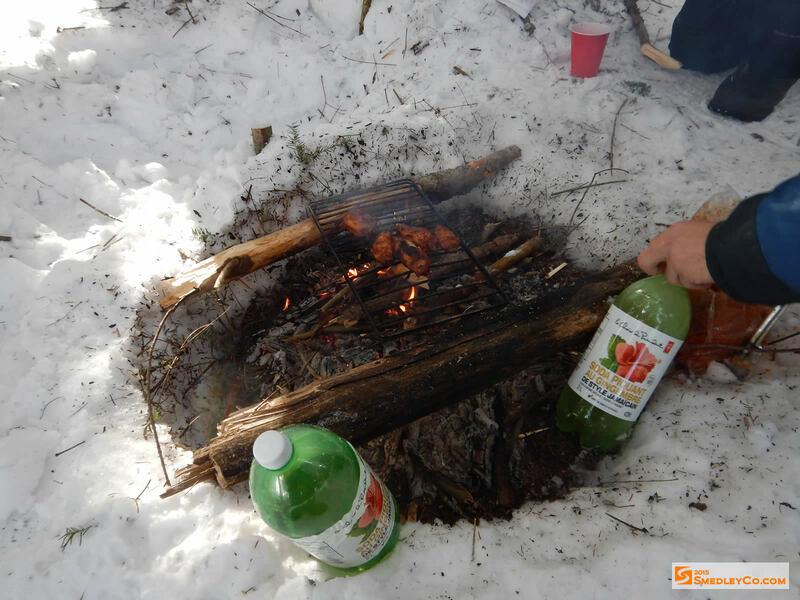 Hardest part was keeping the Ginger Beer thawed. Time flew by and lots of laughs were had. 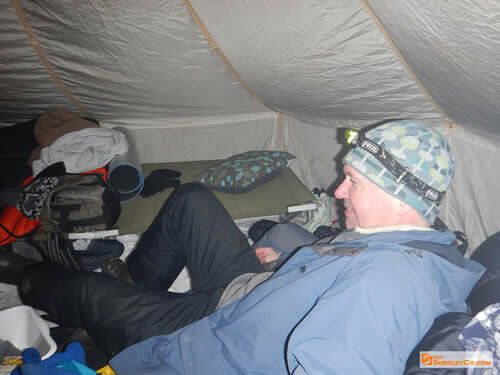 Luckily, or not, there was cellphone reception in camp and we were able to stay abreast of what was going on in the Twitterverse, as well as check the weather. I would remind everyone to take care when partaking of alcohol while camping. 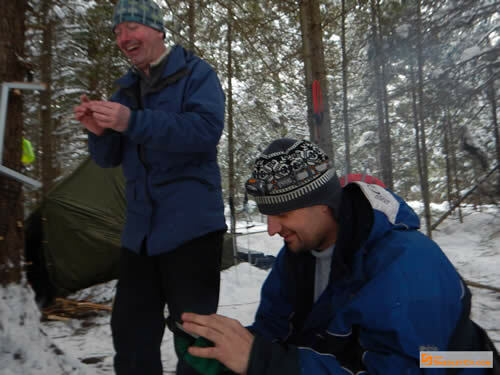 But we did have a chuckle when every weather report said to “avoid prolonged outdoor exposure” and “avoid drinking alcohol” as we had another round around the campfire in -26 degrees. Not everyone is as stupid as we are though. Glen laughs while Markus plays with his cellphone. When the light started to go amongst the trees we went inside the tent and began supper preparations. Tonight was my turn and I reheated a precooked beef stroganoff meal with buttered rolls. 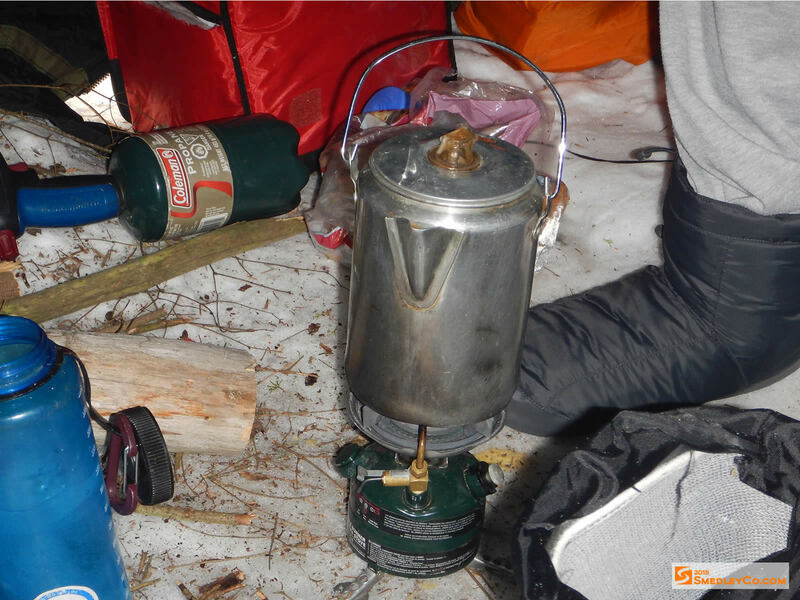 Glen had a fancy LED lantern that gave a lot of light inside the tent, but the cold sure affected the batteries. 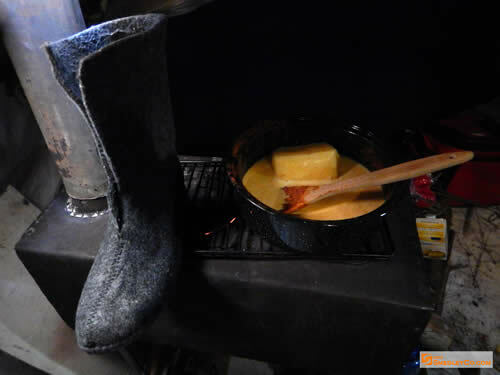 It’s always a long ordeal to successfully warm up a frozen block of dinner on the wood stove. So we nibbled on snacks and chatted way, some people had cellphones to play with too. Glen stretches out in the hot tent. 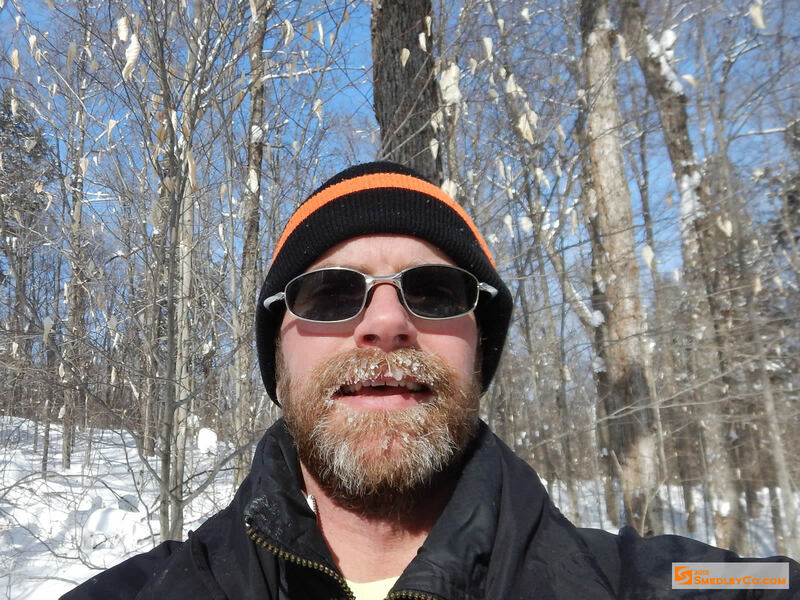 It’d been a tough day in the winter bush. Getting a big pile of firewood and burning a bunch of it while we relaxed for the afternoon made us sleepy. It was a fairly early night again. A bitterly cold long weekend trip to familar Pinetree Lake. 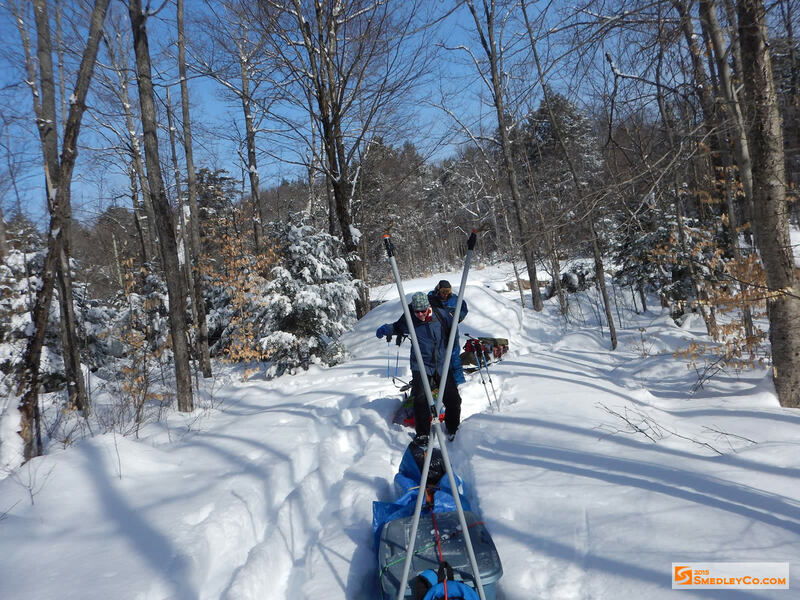 A large crowd showed up for the annual winter trip.